Punjabi is an ancient language, which embarked on a literary career rather late. 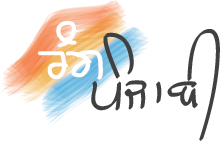 Its script Gurmukhi, is based on Devanagri (the script in which Sanskrit was originally written). It has over 90 million native speakers according to the Pakistan census of 1998 and the India census of 2001, which makes it approximately the 11th most widely spoken language in the world. Punjabi emerged as an independent language in the 11th century from the Sauraseni Apabhramsa. Guru Arjan Dev ji, the fifth Guru, compiled Sri Guru Granth Sahib with a substantial portion of the Guru Granth Sahib in Punjabi. We are making some minor efforts to promote Punjabi. Here we present Virtual Punjabi Keyboard so that anyone can type Punjabi easily without using any font, buying Punjabi Keyboard hardware or any other special software. Portable. Means content written using our Virtual Punjabi Keyboard can used anywhere (like Blogs, MS Word documents, Web Community Portals, your Web Profiles, etc.) without any need of external fonts. We are using Unicode format which makes it portable. We will like to hear from you. Your comments are valuable for us.